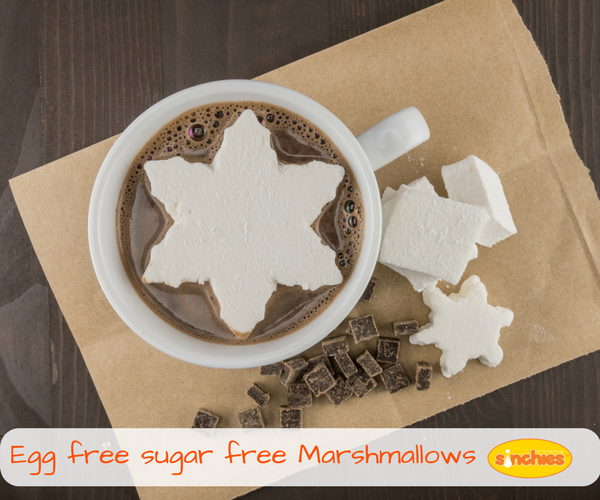 Egg free, refined sugar free light and fluffy delicious marshmallows that are so quick and easy to make and have 4 ingredients. No numbers, colours or other additives - these are a hit with the kids! Water, honey, vanilla bean and gelatin - that's it! Measure the water and honey out into a saucepan. Scrape the seeds out the vanilla beans and add this to the water and honey. Heat for about 10 minutes on the stove top until the mixture begins to bubble. Alternatively in the microwave for about 10 minutes. Or a Thermomix/bellini on Veroma temp for the same length of time. You need to beat this until it's thick and fluff and forms peaks, just like when making meringue. Mine took me half an hour all up of beating. Spoon the fluffy mix into silicone moulds and leave to cool on the bench for a while before putting it in the fridge. The reason for this is that if you cool it too quickly the mixture will split. Once your marshmallows have set, dust them in a coating of 1/4 cup corn flour and 1/2 cup icing sugar (mixed together) to stop them from sticking together. OR coat them in some coconut or melted chocolate. I have added a few drops of Hoppers food colouring to make some coloured ones.